Whisker pad tissue section. Green: H2BGFP labeling nuclei derived from neural crest cells. 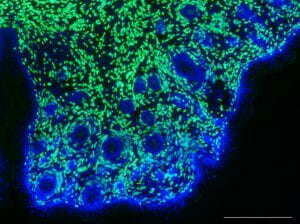 Blue: DAPI staining, labeling nuclei of all tissues. Image from Yang Chai’s lab.